Scroll down this topic to see my latest song list. The songs mentioned in the list above are in my collection. I have them all on cd. I do have Lost Horizon on film but not on disc, that's why I didn't listed that song. Thanks. I'll be double checking to see what I'm missing. Were the tracks from the Best Friends TV show or the specials released in CD form in Europe? Those would be the 1984/85 list. As I recall, the series started in production in June/July 1985. Any chance you know where the BF songs were recorded? Is there a facility that could handle recordings in Santa Cruz or Salinas, or even Santa Barbara? Guess I'll be checking the list tomorrow, too late tonight. My tracks of The Best Friends show are taken from a very bad tape/cassette (don't know the right word) and put to cd. A few songs are missing a little part of their intro. The sound quality is not well, but hey it's Doris Day. 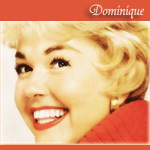 I know that The Doris Day Society in England a few years ago released a cd with a few tracks digatally remastered. I didn't bought one cause these songs sounded resanoble on my tape. I believe the songs where This is the way I dreamed it and My heart. So there are songs around with better sound quality. Stephen Munns has on his site, a small piece of the song: Best Friends and that song sounds better than the music on my cd I think. I believe you'll can find some information on The Best Friends tracks in Eric Braun's book. I don't have a copy here on my work, I will check it out when I'm at home. Yes Lauren, that was very funny, I got tapes of the convention years ago and thought this story was so funny. Everyone assumed Doris called the dog Blue becuase of the type of movie he was trying to see and when she realised she said something along the lines of ' oh, not because of that, he [the dog] was a big kerry blue'! This list is now avaliable for two years (first posted 05 - 03 - 2006). I hope people can use this list for their own collection. If updated the list this weekend, so I hope that the most errors are out of the list. Peter -- That is fantastic ! Thank-you for compiling this list .... I printed it and I'm going to look it over today. This is a huge amount of great information ! Peter, that is incredible!! Thank you so much for sharing all your hard work with everybody! That is awesome! "I wouldn't bring up Paris if I were you. It's poor salesmanship." If someone can help me with the next 99 songs... I will have a 1000. Well here's a list of some songs I haven't found. There maybe some mistakes in this list, because I've found these titles on other people lists/sites or in books. its simply AMAZING how many songs she has recorded and that you have almost all of them i can't believe its almost 1,000 songs! great job finding them! It must have taken a long time! It took me just over 15 years now. could you possibly give us the changes you made or maybe highlight them somehow in the original post? Would be very much appreciated. Hi Peter....What a great list..now if we could just FIND some of those songs so that we can hear them. In Addition, here are more songs from her BEST FRIENDS series..not sure which episodes, but I know I have them on a cassette which I got from Australia. Wow, you are really very much into the details, respect! Mike, Peter had mentioned the Best Friends songs he has in his first post. Peter, shouldn't ' 476 Que Sera be from the "Alfred Hitchcock Radio Show 1955"? Or is there another live version? "Alfred Hitchcock Presents Doris Day"
Or was that just a typing mistake and should be 1956? I think it's a typing mistake. My information comes from an list from someone called J. David Goldin and I've used his list and a few nameless one to get this information. For all I know The Man Who Knew Too Much is listed as a film from 1956, therefor it seems strange to me that this show with Alfred Hitchcock and Doris sould have aired in 1955. So that combined leeds me to think the show is from: February 1956. Oops, I didn't even think that far regarding the year of the movie... Thanks! An new and update version is put below. Woodrow Wilson General Hospital, VA (Rebroadcast). can be played, as well as downloaded. So nice of you to mention this show. It's sounds so good and it's a new treasure for my collection. I hope more will be found in the near future. I love the sound of (a young) Doris Day!! !